The Auvergne area is a massive natural outdoor playground with every adrenaline-inducing activity available. This is an area of breath-taking natural beauty, with huge rocky gorges, lush forests, clear flowing rivers and an abundance of wildlife. Auvergne is proud of its heritage, and this is reflected in the number of well-preserved historical monuments and architecture. Camping la Ribeyre is an idyllic campsite, perfect for relaxing after a day of exploring the surrounding area. 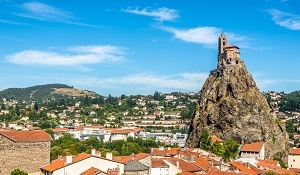 Auvergne is renowned for its stunning scenery and its two regional parks, the Auvergne Volcanoes Regional Park and the Livradois-Forez, showcase the best of its natural setting and identity. Take a unique train ride on the Panoramique de Dômes to the summit of the Puy de Dômes volcano. This is a fantastic way to learn about the history of the landscape, and the views are second-to-none! The Way of Saint James is a well-preserved pilgrim’s journey from Puy-en-Velay in Auvergne to Santiago de Compostela in Spain. The town is watched over by the statue of Notre-Dame-de-France and the Saint Michel D’Aiguilhe Chapel, perched upon a rock 82 metres above the town. Auvergne has 9 picturesque villages that are officially listed as ‘France’s finest villages’, including Montpeyroux and Charroux. Take a visit to soak up the charming culture, beautiful buildings and rich history of the area.